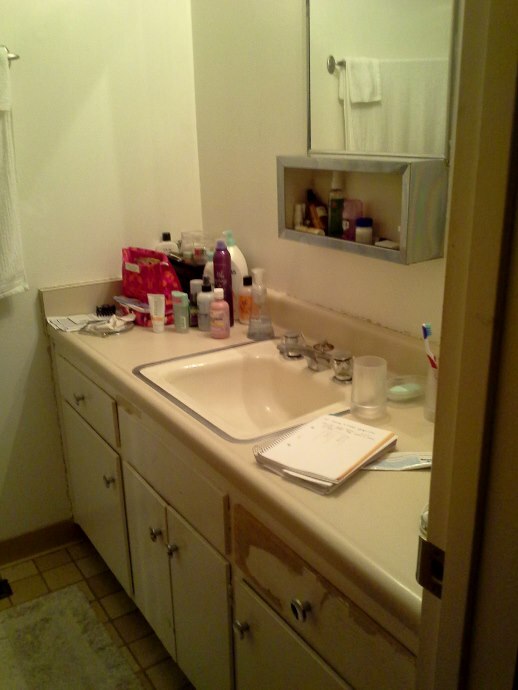 This is my latest project… a master bath renovation in Oakland, CA. We stole about a foot of linear space around the perimeter of the bathroom from the master bedroom and closet then gave it to this tiny Master Bath. I am so pleased to see this design become a reality! 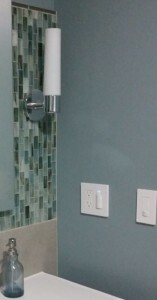 The client selected this fabulous Walker Zanger tile. It is called Tozen and it was designed by Lunada Bay. The color is Oxygen. It comes in many different finishes. This finish is called Silk and it has a muted calmness about it. 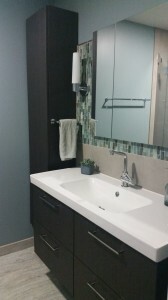 The style is called Soldier which is 1″x2″ off set tiles which reflects the client’s need for something more special than the typical subway look. For the wall color, I provided the client with two options and they selected Cloudy Sky. It’s a Benjamin Moore Color. Number BM2122-30. The vanity and tower are by IKEA from the Godmorgon Collection. We considered several options for the medicine cabinet and selected the Kohler Verdera as it offered a sleek line, flexibility with the door swings and shelf positions and fit the space perfectly. We worked with James Silva Construction who did a meticulous job keeping the dust down! 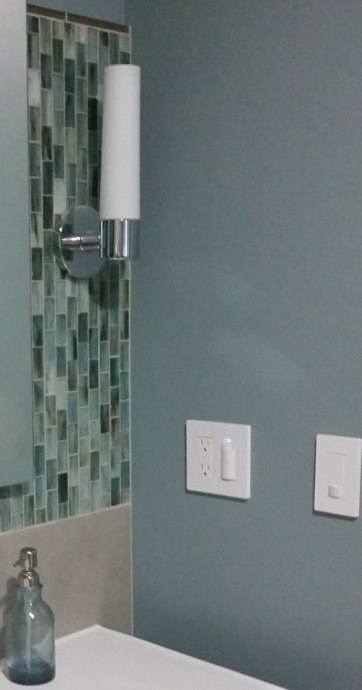 Their bathroom is now a Restful and Renewed Retreat!